Syfy has announced that Killjoys has been renewed for a second season. The 10 new episodes will begin airing next year. NEW YORK – September 1, 2015 – Syfy announced today that the acclaimed series Killjoys has been renewed for a second 10-episode season, scheduled to air in 2016. From Temple Street Productions (Orphan Black) and Michelle Lovretta, the creator of Lost Girl, Killjoys averaged 1.5 million viewers (L3) in its first season. Produced in association with Space and distributed worldwide by Universal Cable Productions, Killjoys follows a trio of interplanetary bounty hunters who chase deadly Warrants (fugitives) throughout the Quad, a distant planetary system on the brink of a bloody class war. 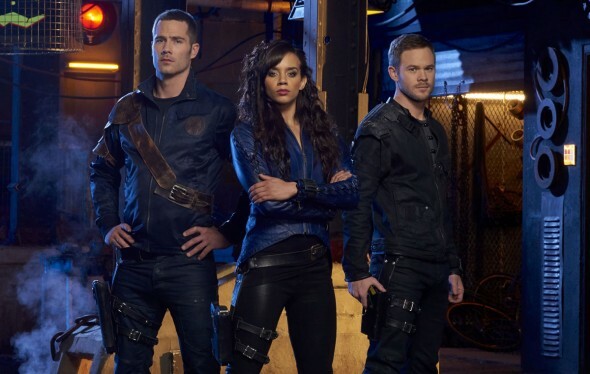 The series stars Hannah John-Kamen as Dutch, Luke Macfarlane as D’avin and Aaron Ashmore as John. Production Executives for Bell Media are Rebecca DiPasquale and Kathleen Meek. Tom Hastings is Director, Independent Production, Bell Media. Corrie Coe is Senior Vice President, Independent Production, Bell Media. Tracey Pearce is Head, Specialty and Pay. Randy Lennox is President, Entertainment Production and Broadcasting. The second season of Killjoys will join a rich 2016 Syfy lineup that includes previously announced scripted series The Magicians, based on Lev Grossman’s bestselling novels; Gale Anne Hurd’s thriller Hunters, the epic 10-part drama The Expanse (premiering December 14), and new seasons of 12 Monkeys and Dark Matter, also announced today. What do you think? Do you like the Killjoys TV show? Do you think that it should have been renewed or cancelled instead? Thank you for keeping this show it is a great show. Awesome. My girlfriend watches all these shows with me so I’m glad they were kept. I read somewhere they were thinking of a crossover for Killjoys and Dark Matters. As for the short episode order, they may still not be 100% sure to invest in a longer season. But more can always be added between now and next summer (I figure it’s a summer season show). Now that 3 of my favorite shows are renewed how about Defiance’s renewal? I am glad the Killjoys will have a season 2. I like this show alot. It is different from what I usually watch. I really like the main characters. So happy it has been renewed and we can see more stories unfold but also wish they had more then 10 episodes for Season 2. So happy this has been renewed. Great show and having 3 hot actors on it doesn’t hurt either. Ditto what Georgeanne said. I’m 66 years old, and sci-fi is my main go to. It just bothers me so much that if it doesn’t hit their idea of what the correct demographic should be, then the series is gone. This happens to me more than I care to admit! Awesome, I love this show!!! It’s not quite as good as Dark Matter but it’s close!!! It really does deserve more than 10 episodes…………………. Keep up the good work SyFy!!! I like this show a lot. Very fast paced and edgy. And I am not in the networds target demographic as far as age. It makes me sick that the networks base their projections on such a small window of views as far as age is concerned. My kid are in the targeted age bracket and they don’t watch T.V. The networks need to wake up because more viewer are outside their targeted age bracket. Yup, today’s “youths” a;; have their noses in their phones. They don’t have time for good programming. If you have any doubt just watch how fast the big 3 change up their programming (does anybody even watch ABC, NBC or CBS anymore) to try and attract audiences, what losers. Keep up the good work SyFy!!! SyFy Friday is must watch TV!!!!!! !